I Went To The Land Down Under! So I’m *finally getting around to blogging about my trip to Australia and Hong Kong, a mere *77* days after returning from said trip. I’m trying to think of a way that (a) won’t take me eleventy billion years to write it all and (b) won’t bore everyone to tears. Oh and (c) I can piece together from the few notes I took down on my trip and my photos. And to add further complication to my writer’s dilemma, I went on this trip with my then-boyfriend, but after we got home, we split up (Long story short – a big trip together is a good test of a relationship and while he is a good guy, we discovered that we just aren’t compatible enough). So my blog postings will be full of “we did this” and “we did that” and it’s now a historical “we”. Ok, with all that out of the way, I guess I’ll just start with the writing and see what happens! Shortly after booking all the flights and accommodations, I learned that my friend Tanya was moving from Toronto to Melbourne! If only I’d know, I’d have gone there; but it worked out because Tanya and her husband Greg made the trip up to Byron Bay to hang out, which was super fun! That makes a grand total of 48.5 hrs and 38,511 km of flying! To make things even worse, I was severely debilitated by my hip injury. Like, I was limping so badly that at almost every airport we went to, when they saw me approaching the security line up they’d pull me aside with a “right this way, ma’am” and take me through the quick line up, because I was clearly too injured to be standing in any sort of line up. Fortunately, on the way there, the flights weren’t full so I was able to get up frequently to stretch. Perth is the capital of Western Australia and with ~2 million people living in the Greater Perth area, it’s fairly similar in size to Vancouver. And though it’s a big city, it’s remote from other big cities, with the majority of the people being on the eastside of the continent. 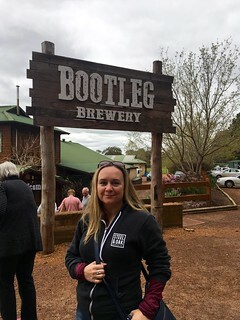 While in Perth, in addition to the conference, we did a bus tour to the Margaret River valley (a wine region), took a train out to nearby Fremantle (a port), and took a trip to Rottnest Island, which is off of Fremantle. 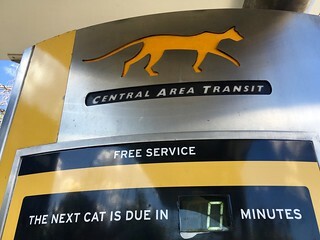 The fact that transit is FREE in the Central Business District of Perth. Seriously, you just get on and off the buses as you please. 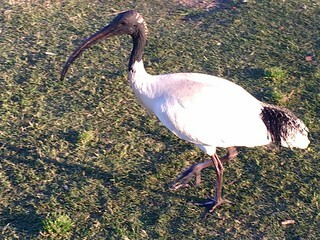 King’s Park – a really big park (sort of like Stanley Park) and it has cool fauna that is native to western Australia. 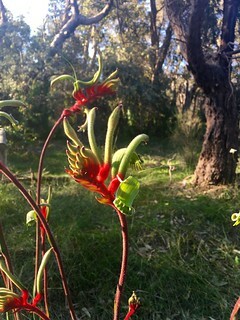 I went for a walk (er, a limp) around there and saw lots of cool plants and fortunately was not killed by any of the deadly animals I am told live in Australia. Beer and Beef Festival. It would have been better if it hadn’t been unseasonably cold and rainy – and they didn’t have any heaters or covered areas, but there were some decent beers and tasty food. 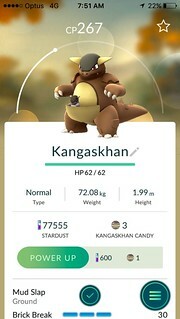 I caught the Pokémon that you can only catch in Australia on my first day in Perth! Cape Leeuwin Lighthouse, where the Indian and Southern Oceans meet. 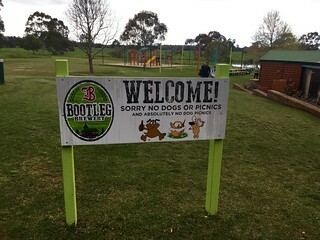 Bootleg Brewery – we had lunch and a flight of beer here. 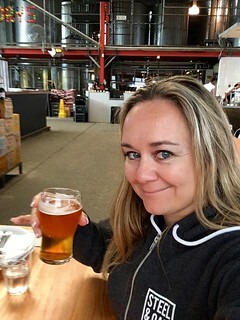 Craft brewing in Australia just doesn’t quite compare to the craft beer scene in Vancouver – but some of the beers were quite good and the food was great! I was representin’ New West with my Steel & Oak Brewing hoodie on at Bootleg Brewing. Sandalford Winery – sampled some wine here. 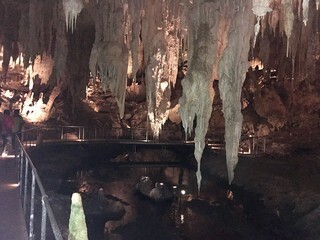 Mammoth Cave – this place was awesome! Just an absolutely beautiful cave. Also, because we were on a bus tour with some older people, it could go up and down the stairs slowly (thanks injured hip!) but didn’t hold up the crowd. A kangaroo. I only got a glimpse of it hopping along the side of the road as our bus whizzed by at dusk, but it was the only kangaroo I saw in all of Australia! 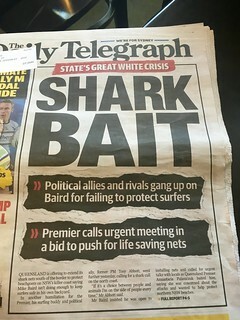 There are bull sharks in the Swan River. 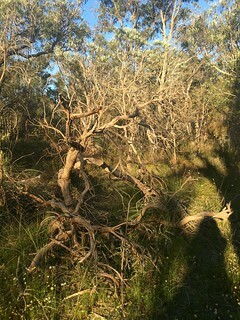 The Noongar people, who are the indigenous people of the south western part of Western Australia, have an origin story where the Swan and Canning Rivers and other features of the land were created by The Wagyl, a giant snake-like creature that slithered around, creating the shape of the land. The “coat of arms sausage“, which we ate at the Bootleg Brewery pub, is so called because it’s made of the meat of kangaroo and emu, the two animals on the Australia coat of arms. AC/DC are from Fremantle (they aren’t) and the song Highway to Hell is about the highway between Perth and Fremantle called Canning Highway (it isn’t). The Busselton Jetty is the longest jetty in the world (the world’s longest jetty is actually in Mexico and it’s 6.5 km long!). The Busselton Jetty, which is nearly 2 km long, is the longest wooden jetty in the world. 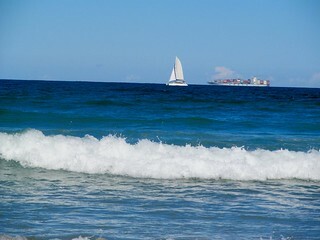 Fremantle is a port city at the mouth of the Swan River. We took a train there, mostly because I wanted to visit the prison! The prison is a museum now and my friend Martha had told me it was well worth checking out. 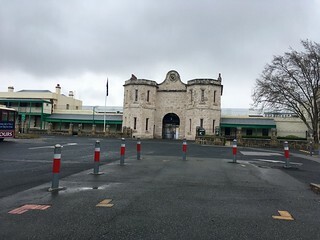 Fremantle Prison was originally a prison for, and built by, convicts shipped over from England. At first England just shipped over petty criminals – like bread thieves – but over time they started slipping more dangerous criminals – like rapists and murders – onto the convict ships. Once England stopped shipping its criminals to Australia, it became a regular prison (i.e., for local prisoners). The cells were really, really tiny and convicts/prisoners stayed in them for much of the day. 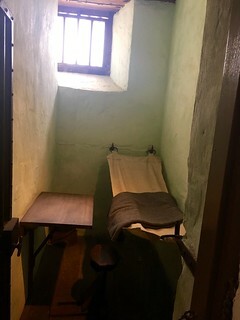 In later years, they knocked down walls to make the cells double this size, but they it got crowded again and so they put in bunk beds and made two prisoners share the double sized cells. 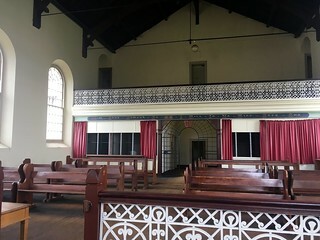 The only place that wasn’t tiny and dark was the chapel, which had big windows and a high ceiling so as to feel open and bright. 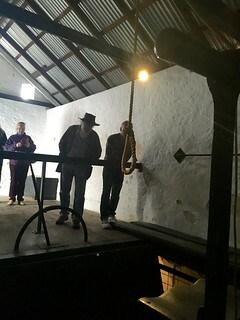 Threatening to revoke one’s time in the chapel was a good way to keep prisoners in line. We got to try out going into a solitary confinement cells, with the tiny window closed up and all the lights off. 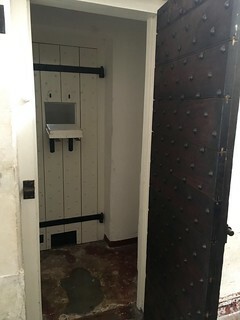 Prisoners would be placed in there for 23 hours a day, with 1 hour of exercise which consisted of running back and forth across a small yard. The walls on each side of the yard had placards with numbers and the guards would yell out a number and you’d have to run to that number on the opposite wall. And repeat. For an hour. And then back to your cell! Behind that second door is a solitary confinement cell. There was a big riot in 1988 and the prison closed in 1991, and shortly thereafter became a museum. What you see in the prison is pretty much what it would have been like right before it closed – very bleak. The Noongar name for Fremantle is Walyallup. 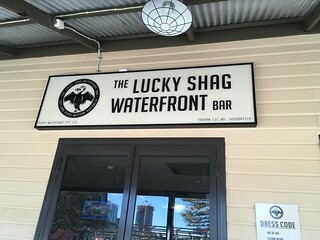 The locals call it Freo. 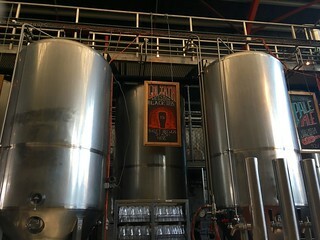 Little Creatures Brewery is there – they make pretty good beer. Wearing my Steel & Oak hoodie at a brewery again. 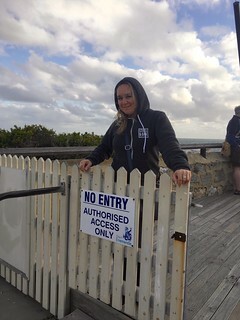 It was unseasonably cold in Western Australia and that was the only hoodie I brought! 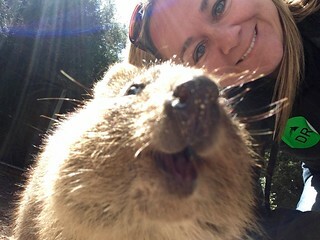 Rottnest Island is 18 km west of Fremantle and is home to the cutest animal in the world: the quokka! 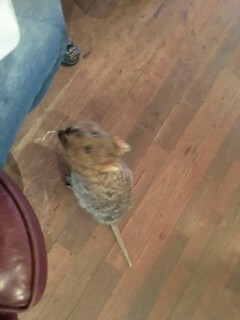 Quokkas are small marsupials – about the size of a small house cat. 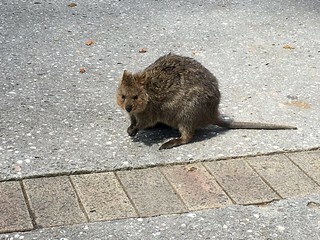 They live almost exclusively on Rottnest (there is a very small population (~400) on the mainland), where there are between 8,000-12,000 living on the 19 km2 island. Having no predators, these adorable little guys are super friendly and will come right up to you (mostly hoping you will feed them, which you shouldn’t because they can’t digest people food and it makes them sick). They are considered a vulnerable species and it’s against the law to even touch them1, unless you are Cookie Monster. 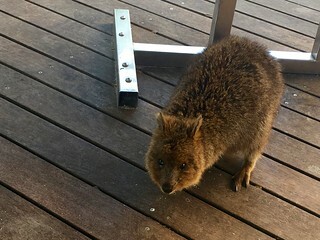 I really, really wanted to bring one home as a pet but (a) it’s illegal and (b) I think the cats might try to eat a quokka if we had one. 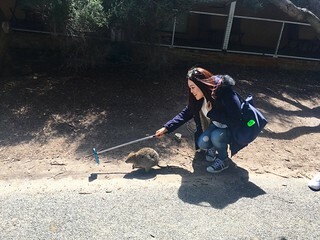 Getting a selfie with a quokka is a trendy thing to do. Here’s some lady doing so with a selfie stick. It was named by a Dutchman who mistook the quokkas for giant rats – it means “rat nest island”. 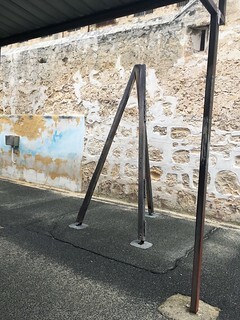 The locals refer to Rottnest Island as “Rotto”. The original Noongar name for Rottnest Island is Wadjemup. No one is allowed to live on Rottnest unless they have a job that requires them to work on the island outside of the hours that the ferries run. For example, if you were a baker at a bakery, you could live on the island because you’d need to do your baking very early in the morning, but if you were a cashier i that bakery, you’d be required to ride the ferry to and from the island every day to get to work. 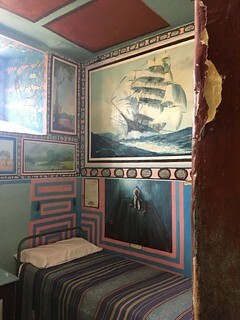 The island was at one point used as a prison for indigenous people. 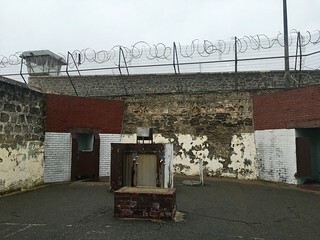 It was also used as a location for a reformatory for boys. A large part of the island was de-forested as people who settled there were unable to farm, due to the poor soil, so they made their living by harvesting salt from the salt lakes, which required fire, which require cutting down trees. They are now trying to re-forest it3. The tour guide on the Rottnest Island ferry, like the Margaret River bus tour guide, told us a few things that were just not true. 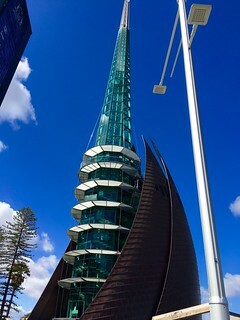 Notably, she said that the government of Western Australia spent $26 billion developing Elizabeth Quay in Perth. According to Wikipedia, the government spent $440 million and then got back $134 million from selling property to developers. 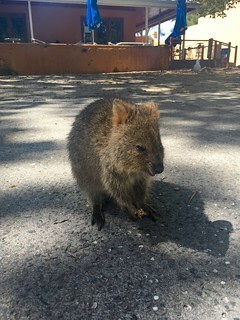 The tour guide on the bus told us that “quokka” is the Noongar word for “food”, but I have been unable to verify this through my extensive Googling4. 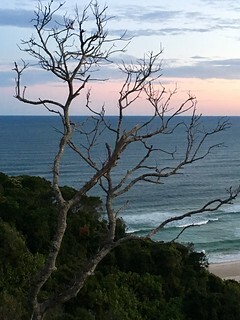 As previously mentioned, the Byron Bay portion of the trip was booked with the intention of going surfing, but due to my injured hip, I was barely able to walk and so surfing, along with its required jumping up and balancing on a surfboard, was not a thing I could do. 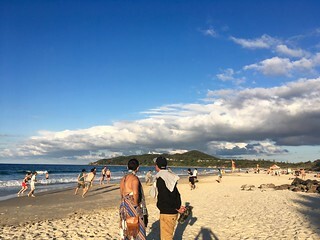 Byron Bay was beautiful though and I had a great time hanging out with Tanya and Greg. I found a giant dead jellyfish on the beach. 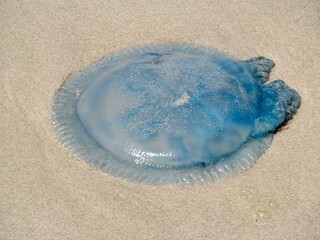 Until I found it, I had forgotten that I should be worried about getting stung by a jellyfish! Although I couldn’t go surfing, I decided to go body boarding instead. I figured since I’d be lying down on the board, my hip would not be required. What I didn’t think about was how powerful the currents would be and just trying to walk out, and then swim out, to catch a wave was really, really not pleasant on my hip. On the plus side, the water was very cold, so it helped numb the pain! 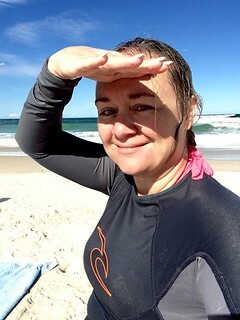 Here I am after body boarding. I look like a drowned rat. Here’s a sign I saw *after* I spent a day and the following morning body boarding. 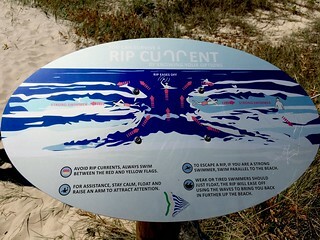 It warns you that you’ll probably die from the rip current unless you follow their instructions5. 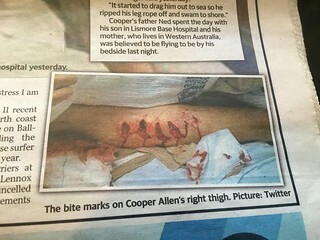 Speaking of the dangers of the ocean, we found out after a day of playing in the ocean that a surfer was attacked by a great white shark at the next beach over from our beach right at the time we were in the ocean. The next beach over was ~20 km away, but that’s really not that far for a shark. 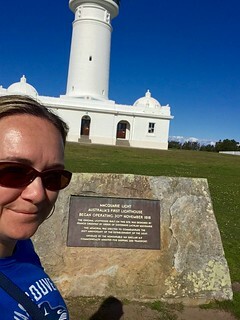 Cape Byron Lighthouse. 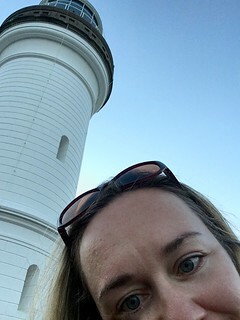 Visiting lighthouses was starting to become a thing for me, so of course we had to check out the big one in Byron, the aptly named Cape Byron Lighthouse6. 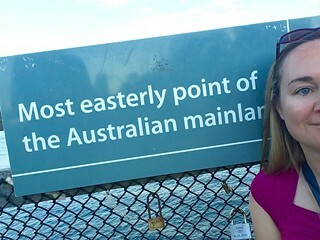 And while we were there, we also got to go to the most easterly point of mainland Australia! I’d already been to the most easterly point of North America this year, so it seemed appropriate! 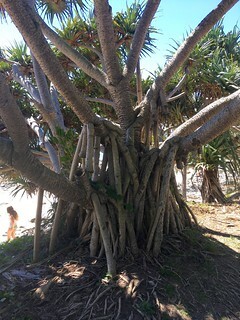 This tree. I seriously love this tree. The Opera House, of course. It’s really beautiful. Didn’t get a chance to see an opera, but did go check out the building. Mad Spuds was a lovely place for breakfast. The owner was super friendly! While out at a pub, we had a lovely chat with some locals who sat at our table, since we were just two and were at a table for four. They were a mother and son and, if I recall correctly, her other son lives in Whistler. 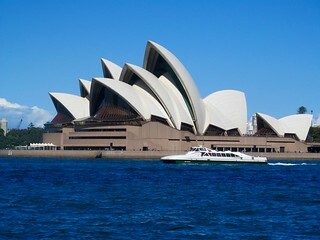 There were a few different option for touring around Sydney Harbour: you could take the public transit ferry, which is less expensive, or you could take one of the private guide tour ferries. We chose the latter because we were told that the tour guides would provide commentary, so we could learn about all the stuff we see. Big mistake. The tour guides barely said anything, so we totally wasted our money. Also, as seemed to be a trend, the tour guides (when they did bother to talk) just make stuff up. For example, they told us that Shark Island got its name because it was used as a quarantine island for animals, and any of the animals that didn’t make it, they just threw in the water and it attracted sharks. Wikipedia tells me that it got its name because the island is kind of shaped like a shark. While on the harbour tour, we passed a few different locations – Fort Dennison (they had a lighthouse) and Shark Island, but we decided to check out Watson’s Bay, mostly because it shares a name with my cat. But I was really glad, because it was beautiful there. There was a cool cliff walk and I got to see Signal Hill (my second Signal Hill of 2016) and another lighthouse (I’d lost count of lighthouses by this point). 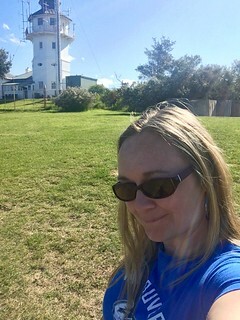 There was actually a second lighthouse at Watson’s Bay that we could have gone and seen, but my limp made for slow walking and to get to the other lighthouse would have taken so long that we’d have to catch for a later ferry, so we decided to skip it to head back to the city. 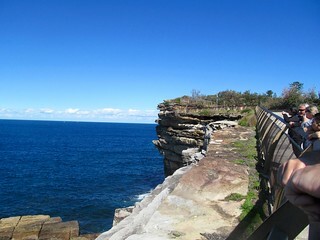 Cliff walk. It made me think of the Cliffs of Moher, but way smaller. Signal Hill at Watson’s Bay. 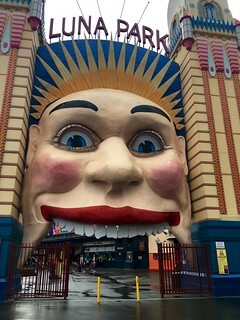 Luna Park has the creepiest freaking entranceway of any location ever. We walked over the Harbour Bridge – we didn’t do the walk where you actually go up top – that costs tonnes of money and also ever since the Edgewalk I’m kind of afraid of heights. Even just walking at bridge deck level freaked me out a bit. The only spider I saw in all of Australia was in a restaurant called Il Barretto. It was large… not larger than the largest ones I’ve seen in BC, but that’s still big enough. I started to freak out a bit and a waitress asked me what was wrong. I said, “There a giant spider on the ceiling!” She glanced at it and said, “Meh. That’s not a giant spider” and then walked away. We had just finished dinner, so I just got the hell out of there. After Sydney, we headed to Hong Kong for a couple of days, but that’s going to be another blog posting!